Twice a year, GKH attorneys and staff participate in a 10- to 12-week wellness program designed to increase activity levels and encourage weight loss. This spring, 23 employees, divided into four teams by practice area, are competing to log the most activity minutes. The winning team will enjoy lunch together, compliments of the GKH partners. 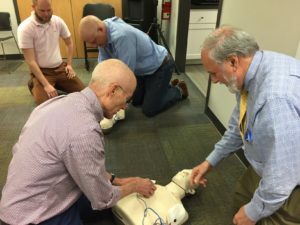 In addition to the activity and weight loss components, the current wellness program offered CPR and AED training for those who were interested. Doug Willwerth from the American Red Cross trained 12 people in the current CPR guidelines and how to use the defibrillator to save someone in cardiac arrest. 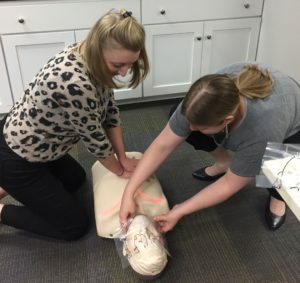 The 3-hour training session included video instruction, live demonstration, and hands-on practice with manikins and simulated AEDs.